Light up your world and show off what you love with this Sonic the Hedgehog pixel light. Everyone’s favorite blue hedgehog is now a collectible bright pixel-art rendition of one of the most iconic gaming characters! Give all your drunk adventures a nostalgic feel with the concealable NES cartridge flask. They make a great gift for any retro gamer and are available in many parody titles such as Legend of Drink, Super Bar-Hop Bros and Drunk Hunt. Lather up and get nostalgic when you bathe by scrubbing clean with this awesome Nintendo 64 controller soap! Each soap bar is a life-size replica of the classic 90’s video game controller that’ll perfectly compliment your retro gaming lifestyle. Become the Hero of Time and cleanliness with this set of Zelda inspired his and hers hand towels. Each cotton towel comes with an embroidered silhouette of the couple for you to place the finishing touch to your bathroom decor. Never get lost on adventures across Hyrule again! These Legend of Zelda maps have an authentic aging effect to give you geographic details from maps inspired by Ocarina of Time and Majora’s Mask. A must have collectible for Zelda geeks! Test out your origami skills with this epic Majora’s Mask papercraft! By using a set of easy to follow instructions on a PDF template, you’ll be able to instantly construct your own Majora’s Mask and harness its powerful dark magic. Keep your brand new Nintendo Switch cozy and scratch free with a custom made dock sock! Each of these fashionable covers are hand made to fit snugly over the Switch’s dock and are available in unique Nintendo-themed patterns. These Shy Guy earrings are a perfect example of the clumsy villain we all know and love from Super Mario! The little troublemakers have the appearance of holding on for their lives while dangling from your earlobes. 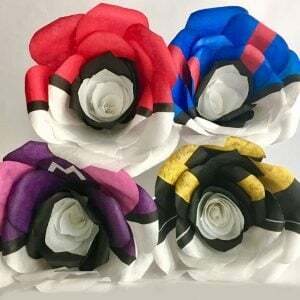 For a Pokemon Trainer, there’s nothing more romantic than Pokeball roses! Capture and secure the heart of someone special to you, by throwing them a bouquet of handmade silk Pokeroses. Nothing quite says “I Choose You” like these beauties. This Pac-Man lamp comes with a remote-controlled dimmer switch to bathe your room in the warm glow of an 80s arcade! Complete with iconic video game sound effects, this lamp will add a nostalgic glow to any game geeks home. Do you love old school video games and playing cards? These pixeled cards will combine the two together into one awesome deck, reminding you of retro 8-bit video games from the 80’s. A great way liven things up on poker night! Bring a spark to your next big party with the Pikachu mascot costume! This gigantic costume will transform you into everybody’s favorite electric type Pokemon, ensuring all eyes remain on you wherever you may go. Nostalgia, functionality and an innovative design! These epic renditions of your favorite SNES games are actually Raspberry Pi cases! Each custom case is methodically handcrafted from wood and comes complete with a stand. Prove that you’re the ultimate Zelda fan with this stylish wooden clock! Inspired by the crest of the Royal Family of Hyrule, this hand crafted clock offers a unique addition to any office, man cave or gaming room!